The cast of Noah Knows Best. 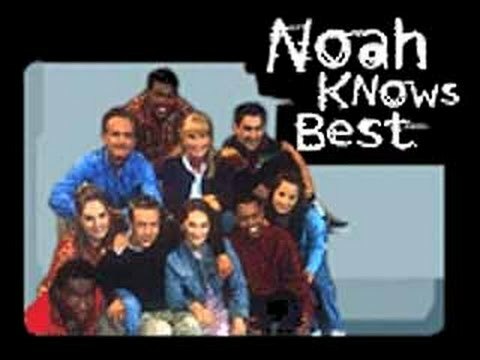 Noah Knows Best was a short-lived sitcom that aired on Nickelodeon from 2000 until 2001 and being one of Nickelodeon's shortest-lived tv shows. Starting Phillip Van Dyke, the show revolved around Noah Beznick as he goes through life in New York City. It was one of the last tv shows to have been filmed at the now-defunct Nickelodeon Studios in Orlando. Many considered Noah Knows Best to be the male version of Clarissa Explains It All. Due to the style of comedy that Clarissa Explains It All used being outdated many saw Noah Knows Best to be unfunny and this caused the show to suffer because of that. Due to low ratings and viewership, Noah Knows Best was canceled after eight episodes leaving five episodes unaired in English. Noah Knows Best follows a teen named Noah Beznick (Phillip Van Dyke) as he balanced his social and school life out. He and his sister Megan (Rachel Roth) are always trying to get each other into trouble. Both live with their parents in an apartment in central New York City. [Nickelodeon's] view of what the show should be and my vision of the show were not the same and they never really matched up, which was ultimately a reason for its lack of success. Due to the very low ratings the show received, it was removed after five episodes. Reruns of Noah Knows Best ran on The N (now TeenNick) in 2002 and 2003, but no reruns have aired since. No home media for Noah Knows Best was ever released. Between July 22, 2018 and July 27, 2018, all 13 episodes of Noah Knows Best were uploaded to Dailymotion. However, all of the episodes are in Russian and the episode titles for episodes 4 and 6 have been swapped. As of the writing of this article, only a few clips from the English broadcast of Noah Knows Best have surfaced.